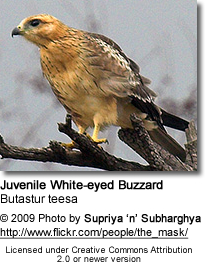 The White-eyed Buzzard (Butastur teesa) is a medium sized hawk found in South Asia. 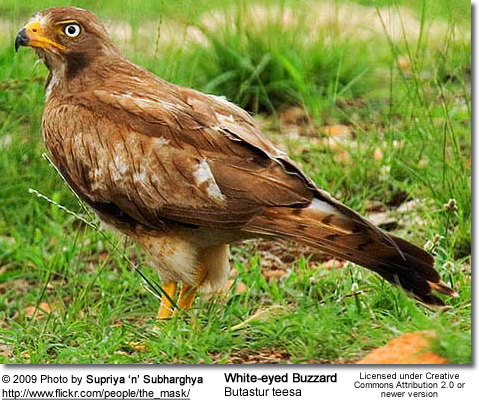 A small greyish brown hawk, about 45cm long, the White-eyed Buzzard has a white throat, two dark cheek stripes, brown and white underparts, and orange-yellow cere. Eyes white or yellowish white, conspicuous at close quarters. 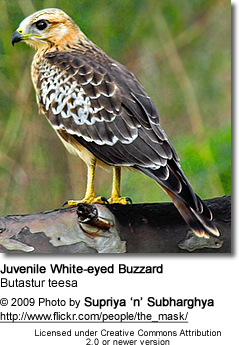 A whitish nuchal patch and buffish wing shoulders provide additional clues to its identity. Habits: Usually occur singly, in open scrub country.Affects dry open country and thin deciduous forest; avoids humid and densely-wooded tracts. Rather sluggish. 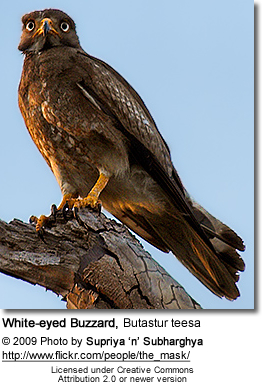 Perches on dry trees, telegraph posts, etc., and swoops down on its prey. 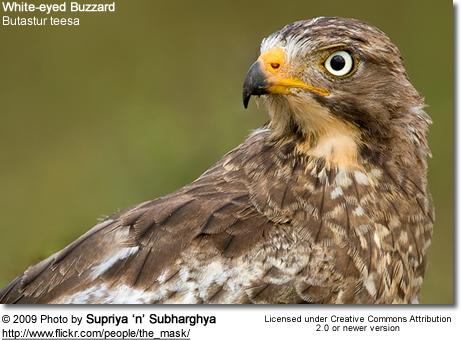 Often in company with larger birds of prey, silhouette, of the rounded wings reminiscent of the Shikra. A not unpleasant, plaintive mewing, usually uttered when pairs soar in circles high up in the air. The drier parts throughout the India up to about 1000 m in the Himalayas (scarce in the southern peninsula); Pakistan; Bangladesh; Myanmar. Not Sri Lanka. Resident, but also moves locally. Locusts, grasshoppers, crickets and other large insects as well as mice, lizards and frogs. Season: principally February to May. Nest: a loose, unlined cup of twigs like that of a crow up in the fork of a thickly foliaged tree such as mango, preferably one in a grove. Eggs-3, greenish white broad ovals of a fairly smooth texture. Both sexes share nest-building and feeding young; female alone incubates. Ali, Salim; J C Daniel (1983). The book of Indian Birds, Twelfth Centenary edition. Bombay Natural History Society/Oxford University Press.